The origins of golf in its basic form are much debated, but it’s clear the current format of the game was born in Scotland during Medieval times. Other variations of golf have been recorded in the Netherlands and China hundreds of years before the game as we know it was first played in Scotland. The game then spread throughout Britain and then on to the British Empire and the United States sometime in the late 1800’s. Some people believe the modern game of golf was invented by the Scottish sometime in the 15th Century, and those people would be correct in thinking that, but a game similar to golf was also played in China during the Song Dynasty, 500 years before there were any records of the game being played in Scotland. Chinese records for this time period show drawings of the game referred to as Chuiwan (Chineses for ball-hitting) along with an explanation. There were 10 clubs used which included a cuanbang, pubang, and shaobang, which are believed to have been the equivalent of the driver, 2 wood, and 3 wood. The clubs had gold and jade moulded onto them, giving the impression the game was for the wealthy. There are documents in China relating to a Southern Tang official asking his daughter to dig holes as targets. Some people believe that Mongolian travellers then took the game to Europe and then Scotland, sometime during the middle ages. There are later reports of the game being played in the Netherlands. Records indicate there was a game similar to the modern day game played in 1297 in the Dutch city of Loenen (aan de Vecht). It was played with a stick and leather ball, and the winner was the person who hit the least number of strokes into a target several hundred yards away. There are also reports of a game which involved hitting a small ball into a hole in the ground with golf clubs in 17th Century Netherlands, which pre-dates the game’s inception in Scotland. There are also many more reports of the game being played across continental Europe. Although there have been many reports of variations of the game being played in China, Netherlands, and Europe, the game as we know it today (played over 18 holes with hazards) originated in Scotland, sometime during the mid 15th Century. During this time the English were ready to invade the country, leading Parliament of King James II to ban sports like golf and football, as they served as a distraction to military training (archery primarily). The ban was placed again in 1470 and 1491, but the Scottish public generally ignored it. In 1502 the ban was lifted by King James IV who himself took up the game. In 1744 The Gentleman Golfers of Leith was the very first golf club in Scotland, Duncan Forbes wrote the very first rules of golf. Unlike the complex golf rule book you see today, there were just 13 rules. They were written for the golf competition on the Leith Links, the prize being a silver golf club. The winner was John Rattray (a physician) and he was crowned ‘The Champion of Golf’, and was therefore the winner of the very first Golf Open Championship. The Gentleman Golfers of Leith were later to become known as The Gentleman Golfers of Edinburgh with a new clubhouse erected in 1768 which was then later moved to Musselburgh, Lothian in 1836. The very first reference to the historic town of St Andrews in golf terms was back in 1552. A year later the links at St Andrews were given public access. In 1754 the Society of St Andrews Golfers was formed as to create its own annual competition using the rules used by Leith. Stroke play was introduced in 1759, followed by the introduction of 18 holes in 1764. The club was given the name of Royal and Ancient (R&A) in 1834 and the famous clubhouse was constructed in 1854. The Royal and Ancient Golf Club of St. Andrews became the premier golf club because of its spectacular golf course, facilities, its publication of rules, and of course its Royal Patronage. 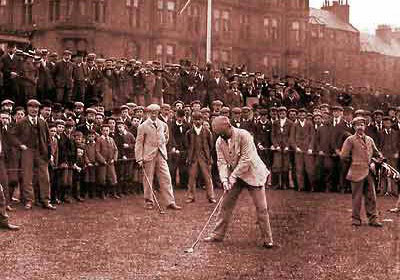 It was R&A that first club to push golf as a proper sport not just a game. Golf in its current form is believed to have been played at Blackheath, London in 1608 by King James VI’s son Henry Frederick. The area they played was later to become known as the Royal Blackheath Golf Club in 1766, the very first golf club outside of Scotland. Due to Britain’s ever expanding empire at this time, many people travelled to these new colonies, and took the game with them. The first golf club outside of Britain was the Bangalore Golf Club in India, which was formed in 1820. Others include the Royal Calcutta, India (1829), Royal Bombay Golf Club, India (1842), Pau, France (1856), and the Adelaide, Australia (1870). The game was beginning to grow but it did not receive renowned acceptance outside of Scotland until the late 19th-century. It was around this time the Victorian Revolution brought with it the growth of transport and railways. Tourism flourished, and for the first time ordinary people could travel coast to coast. Golf courses started to pop up all over the place, England had a total of 1,000 by 1914. Golf in the US arrived around the late 1770’s, with evidence of an advertisement for golf clubs and golf balls in the Royal Gazette of New York in 1779. As in England, it wasn’t until the 19th Century when golf really began to grow in popularity. The identity of the very first golf club in the US is widely disputed, but something that is not is disputed is the date in which the United States Golf Association (USGA) was formed. In 1894 representatives from the Newport Country Club, St. Andrew’s Golf Club, Yonkers, New York, The Country Club, Chicago Golf Club, and Shinnecock Hills Golf Club met in New York to discuss and form the association. By 1910 there were 267 golf clubs in the US, and by 1932 there were a reported 1,100 USGA golf clubs across the country. Walter Hagan became the very first American born winner of the Open Championship, which showed the early signs dominance of US golfers that we’ve become to recognise throughout the years. Today there are a total of 9,700 golf courses that are associated with the USGA.